Main Street & Kindergarten Center is focusing on GRATITUDE as our November Character Trait. This goes well with the tradition of Thanksgiving & also the respect for Veterans’ Day. We will model Gratitude & explicitly teach while reinforcing with a focus. Ironically, we express Gratitude for students showcasing Gratitude for peers and others. This November character trait Focus on Gratitude is sponsored by Monicals’ Pizza & Mark Shanks of Shelbyville. 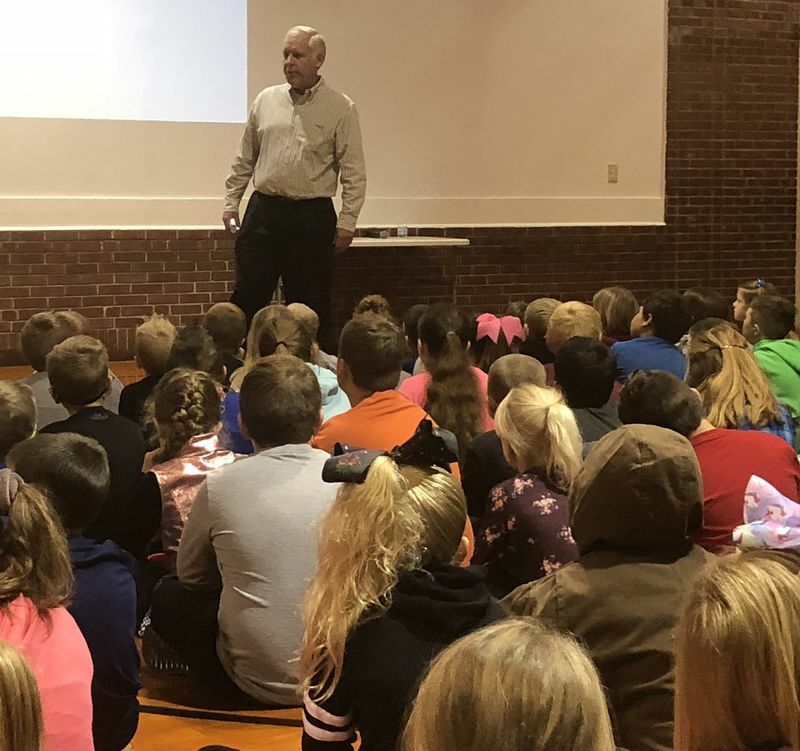 To “kick-off” this Character Trait focus, Shelbyville Alumni & Mayor, Jeff Johnson, spoke to all (1st – 3rd) students on Monday, November 5th w/ two sessions. He did not realize in the moments how much these experiences influenced his development and how much he would benefit from them in his life. As he reflects now, he really has a deep appreciation and feels moved to show his appreciation for “how they shaped him.” This is why he wanted to become mayor: to give back to the community. Mayor Johnson then asked students to think of people or experiences they are thankful for. He gave some time for auditory processing and reflection. The, he prompted a few student-leaders to share. The students identified family, pets and experiences. The mayor admitted that during times of sorrow or conflict, etc… it is difficult to control your mindset and focus on positive and what really thankful for but it can be powerful. 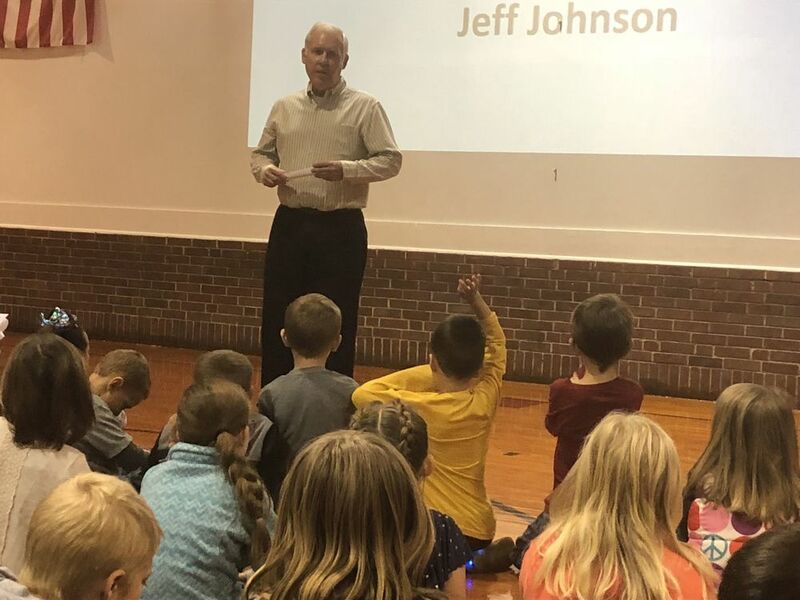 He asked students to “do him a favor.” He wants them to tell someone thank you and why every day. This will have a positive effect on the other individual but there is a positive effect for them as well and the relationships they grow. This is good for any family or team or community. This is an important message for our students to understand the power of gratitude as returning kindness with a positive attitude. We discuss and practice with the students expressing gratitude. Gratitude is most effective when it is specific & timely. This means that commenting on a peer’s lunchbox does not have the effect that “I thought we made a good team during math groups today; Thank You.” does. 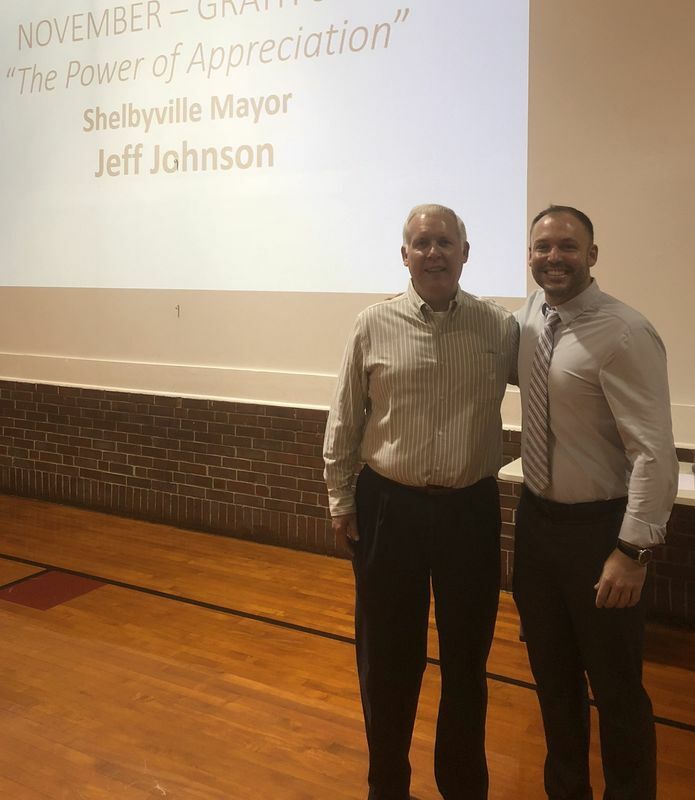 Thank you, Shelbyville Mayor, Jeff Johnson.